In the late summer and early fall of 2015, the BCHS (Brown County Historical Society), via the Ainsworth Hospital Auxiliary Thrift Store, received four quilts. Of the first two, one [was] a friendship crazy quilt and the other was a pieced shoe fly patterned. Two notes were in the sack with these. Of the second two, one was another friendship crazy quilt and the other was an unfinished crazy quilt made of corduroy. Kathy Burchell and Deanna Reyman checked the 1910 census and found that the names on the quilts were of women of Sanborn County, SD. Here are the quilts that we think were made in your county. We received the one with the blue back and the blue and white shoe fly pattern one together in a sack. The notes were loose in the sack with these quilts. A few weeks later, we were given the other two quilts. The second friendship quilt was pretty dirty. In 2016, I visited the International Quilt Study Museum at Lincoln. I asked there what they do with quilts that are dirty. They put them in a freezer for two weeks before they are stored in acid free paper and boxes. They say the dirt is less harmful than washing them. So the fourth quilt is made of corduroy with the edge unfinished. If you decide that you want the other two, we will be glad to send them. We hope your museum does well. If anyone would like to view the quilts or see the census data sent with the quilts, or if you have any other information you would like to share, contact LaMae Peterson in Woonsocket. …Also see pictures of the quilts in this week’s issue of the Sanborn Weekly Journal. The Woonsocket Community Theater gave two performances of “Nana’s Naughty Knickers” last Friday and Saturday evenings. It was the inaugural event on the brand new Event Center stage. 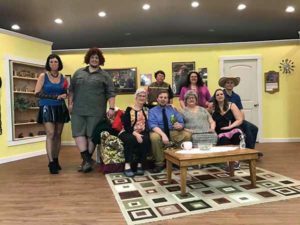 The cast of the show is pictured in full costume, left to right standing: Lisa Snedeker, Jordan VonEye, Jack Davis, Carrie Gutierrez; sitting: Margie Larson, Brett Kroeger, Carrie Howard, Becky Potrament and Jason Potrament. 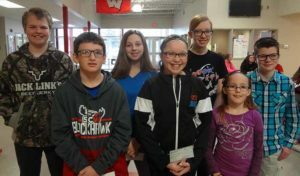 Winners in the local CDA Education Contest are, back row: Kylie Schlenker, Madison Schmiedt, Kaitlin Brueske and Patten Peterson; front row: Carter Christian, Anna Bella Fry and Reese Stephens. Winners of the Catholic Daughters of the Americas (CDA) Education contest were recently announced. Those who placed were: Computer Art, Division 1: Carter Christian, first; Reese Stephens, second; Patten Peterson, third. Computer Art, Division 2: Madison Schmiedt, first; Kaitlin Brueske, second; Kylie Schlenker, third. Essay, Division 2: Anna Bella Fry, first. 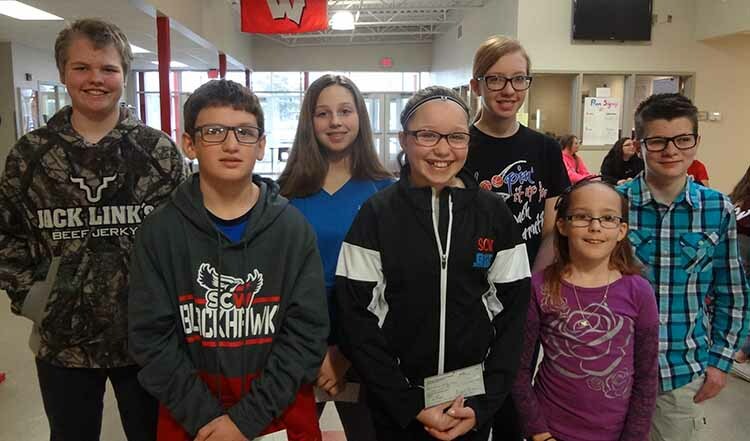 First place winners received a $15 check from Court Holy Heart #163 of St. Wilfrid, Woonsocket. Second place winners received $10 and third, $5. Division 1 consisted of students in grades 4-5 and Division 2 included grades 6-7-8.